How many people can say that they’ve cooked for the queen before entering their teens? Not that many, that’s for sure. 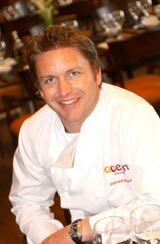 James Martin was born into the life of a chef. His dad ran the catering side of Castle Howard which meant James was exposed very early to the intricacies of fine dining. He began his formal training in Scarborough technical college at age 16. His work caught the attention of Antony Worrall Thompson who brought him to London. He worked in the kitchens of 190 Queensgate, and later in dell’Ugo. He later left England, traveling to France to increase his knowledge and culinary skills in the kitchen’s of some the grand old families of that country. Upon returning to England in 1993, he took on the position of the Hotel du Vin and Bistro in Winshester from the time of its opening. He is known to have changed the menu there everyday. His skill and the variety apparently attracted many clients. There was an 8 week waiting list just to get a table. In 1996, James Martin became a regular member of the TV program Ready Steady Cook catapulting him to public notice. He has now appeared on a string of TV shows including Stately Suppers, Castle in the Country, Yorkshire’s Finest and Saturday Kitchen Live. He even shoed off his dancing skills on the show Strictly Come Dancing. James Martin also has several cookbooks under his name. His first cookbook, Eating In with James Martin, was published in October 1998. His other cookbooks include Great British Dinners and the Deli Cookbook.